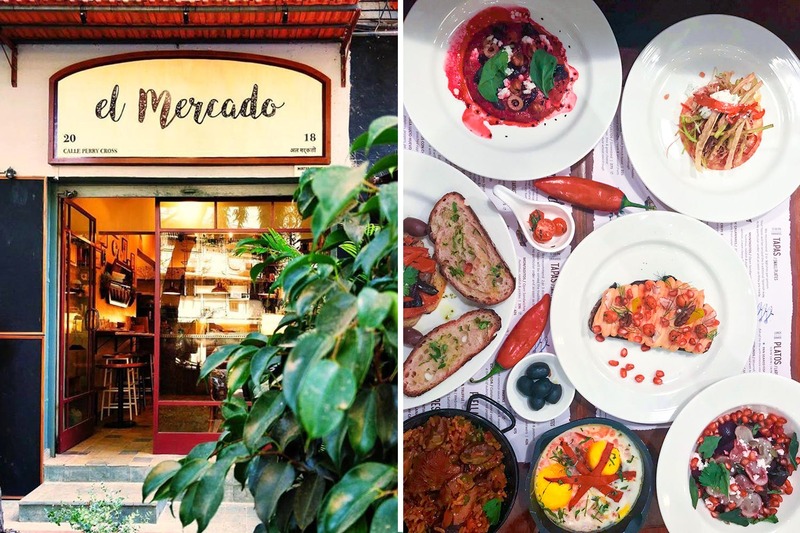 Tucked in the bylanes of Bandra is El Mercado, a newly-opened Tapas café that sings praises of all things Spanish and eggs and is here to rule the roost when we think of the ‘perfect’ breakfast nook in the city. Inspired by the markets of Spain, they have lovingly prepared their menu, so as to let us experience the culinary pleasures of the country in our city. With a menu that focuses a lot on its egg preparations, the café resembles a Spanish café on the crowded streets of Madrid, with a menu board hanging, telling us the picks of the day. It opens by 8.30 AM, so the focus is definitely on the breakfast menu, which has open sandwiches, Spanish omelette, baked eggs, chorizo eggs, Moorish fried eggs, Spanish French toast and more. Their tapas menu consists of Madrid’s famous calamari sandwich, crepe tapas, beetroot yoghurt dip, prawn tapas, and Spanish sliders. Apart from some interesting salads in the menu, they also serve pan-seared fish, lamb albondigas, Moorish chicken skewers, meatballs, pasta and Catalan roasted veggies. Their desserts consist of tarta de Santiago, eggless blueberry cake and crema Catalana. While it’s a mouthful to pronounce, it truly sounds delicious! While it’s small and rustic, there’s a lot going for it in terms of food and the way they’re able to transport you to another place with their ambience and signature dishes. Still hunting for a brekkie date? You know where to head.